The Ministry of Health, Community Development, Gender, Elderly and Children (MoHCDGEC) in Tanzania has partnered with Safe Surgery 2020, GE Foundation, Jhpiego, Assist International, the Harvard PGSSC and the G4 Alliance to initiate the process of drafting a National Surgical, Obstetrics and Anesthesia Plan (NSOAP). On April 17 and 18, 2017, over 70 local stakeholders assembled in Dar Es Salaam, Tanzania drafting process by hosting the inaugural meeting of a National Surgical, Obstetrics and Anesthesia Technical Working Group that will be tasked with writing and developing this plan. The NSOAP will provide a platform to co-ordinate and elevate efforts and resources to ensure higher quality, safer and more accessible surgical and anaesthesia care to the Tanzanian population. It is developed with the aim of including surgical and anesthesia care as a component of Universal Health Coverage, in line with the World Health Assembly (WHA) Resolution 68/15 on strengthening emergency and essential surgical care and anesthesia. The planning process is anticipated to take approximately one year, and upon completion, Tanzania will be among a small group of countries globally that have developed such a plan. The event opened with introductory remarks from the Ministry of Health, the President’s Office for Regional and Local Authorities (PORALG) GE Foundation, and Safe Surgery 2020 as well as representatives from national professional societies including the Tanzania Surgical Association, and the Association of Gynecologists and Obstetricians of Tanzania, the Medical Association of Tanzania. This collaboration between the Ministry of Health and Safe Surgery 2020 demonstrates both the public and private sectors’ continuing roles in bringing safe, accessible and affordable surgery to the citizens of Tanzania. The need for a National Surgical, Obstetric and Anaesthesia Plan has been informed by various studies highlighting the urgent need to prioritize safe surgery in Tanzania. A study carried out using the WHO Tool for Situational Analysis to Assess Emergency and Essential Surgical Care in 2012 found that the average travel distance for patients receiving surgical care is 119 km in Tanzania. The Lancet Commission on global surgery recommends that by the year 2030, 80% of the population should have access to emergency surgical care within 2hrs. However, the current proportion of Tanzania’s population that cannot access surgery within two hours is unknown. The Lancet Commission on Global Surgery estimates that at least 20-40 surgical specialists are needed per 100,000 population. Tanzania’s density of specialist surgical workforce is 0.31 physician surgeons, obstetricians and anesthesiologists per 100,000 population. Although the rural population accounts for over 70% of the population in Tanzania, many hospitals across the country have no permanent surgical or medical specialist, anesthesiologist, and/or healthcare workers with formal specialty training in emergency or critical care. Furthermore, the high expenses involved are known to delay seeking care and are often a major factor in the decision not to seek care at all. Lack of affordable, quality healthcare traps families into poverty where a third of households have to borrow money or sell assets to pay for health care. 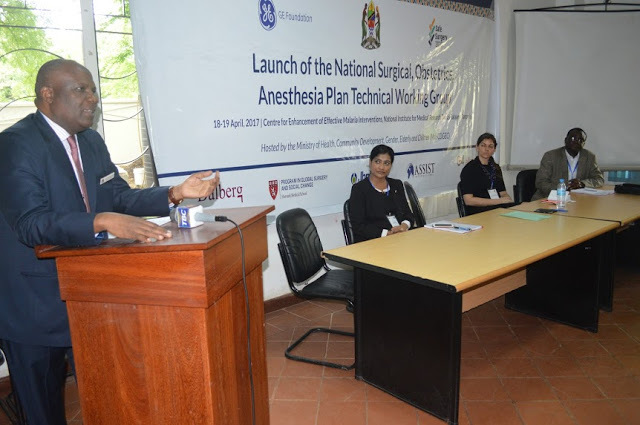 Therefore, to address these challenges, the National Surgical, Obstetric and Anaesthesia Plan will bring together clinicians, practitioners, implementers, and policymakers to work on solutions to the current state of the surgical system in Tanzania, identify what developments are necessary for a functional surgical system as well as identify which of these should be prioritized for the next seven years. The plan aims to improve access to quality, timely and affordable services as well as coordinate the existing efforts to avoid overlap. Safe Surgery 2020 is a partnership of governments, implementers, researchers, and advocates aiming to improve the safety, affordability, and accessibility of surgical, anaesthesia and obstetric care. Safe Surgery 2020 is made possible with support of GE Foundation, hosted by Dalberg Global Development Partners and implemented by the Harvard Program in Global Surgery and Social Change, Jhpiego, Assist International, and the Global Alliance for Surgical, Obstetric, Trauma and Anaesthesia Care (The G4 Alliance).